In 1983, LA is full of beautiful girls, luxurious mansions, and glamorous parties. Eddie Dodson is living the high life. When Eddie meets the cool and aloof Pauline, the attraction is instant and the two live out each other’s fast-paced fantasies until Eddie’s high-rolling life catches up with him and loan sharks start knocking on his door. To pay off his debts, Eddie and Pauline begin a spree of bank robberies across LA, charming tellers at over 60 banks to hand over the cash. Now the two are not only on the run from loan sharks but also have the police hot on their trail in the charged up Electric Slide. Chloë Sevigny appears in the film in a small supporting role as Charlotte, Eddie’s ex-girlfriend. 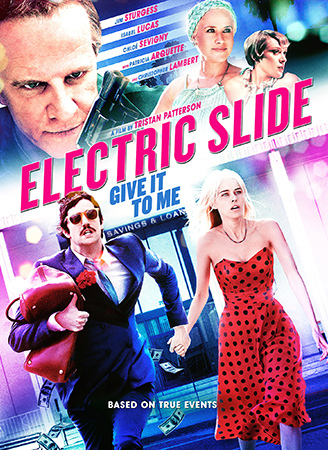 Electric Slide was not well-received during either its festival circulation or theatrical run. The film was lambasted by critics for being overly aesthetic, humorless and uninteresting, and some also questioned whether Jim Sturgess was really the best choice to portray the film’s charismatic bank robber. Electric Slide has received no awards or award nominations. Oh, dear. The reviews when Electric Slide came out were harsh, but I’m sorry to say I don’t particularly disagree with any of them. Although highly stylized (and stylish), an actual point or purpose, or just anything to hang on to for 95 minutes, is hard-found in this film. Jim Sturgess feels very miscast as he affects a voice for his character which, rather than charming or charismatic, chiefly makes him come off as a creeper, while Isabel Lucas’s Pauline appears to have been written into the film only to look waifish and ethereal in line with the film’s hyperaesthetic environments. Only Patricia Arquette is a real standout here as she commits to her colorful, Desperate Housewives-type character, and I wish the film had featured more of her loud and lively Tina. Any other scenes I generally struggled to get through. Below are some Electric Slide-related links that may be of interest to you.